California, which has seen an unprecedented level of devastating fires in recent years, is again being swept by blazes tearing through thousands of acres, whipped into high speeds by the Santa Ana winds. Thousands of residents have been ordered to evacuate, and fatalities were reported but not confirmed. The fires erupted in the dry conditions Thursday morning, and by the evening, Camp Fire, in Butte County north of Sacramento, had burned through more than 20,000 acres. Cal Fire dispatched 1,500 first responders, but by evening, it was still 0 percent contained, according to the Washington Post. Multiple people were injured while evacuating. Acting Gov. Gavin Newsom, filling in for Gov. Jerry Brown while Brown is away, declared a state of emergency. About 40,000 people in Butte County have been ordered to evacuate. 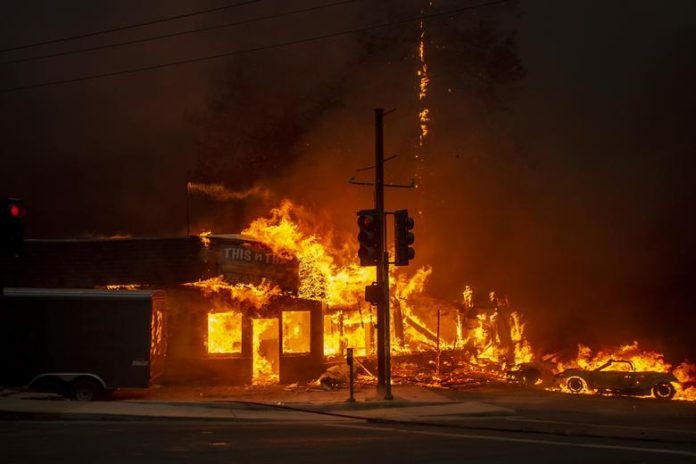 Camp Fire neared the city of Chico and on its way devastated the town of Paradise, forcing the evacuation of most of the town’s 27,000 residents and a hospital, according to the San Francisco Chronicle. Chico, the county’s largest city, has about 93,000 people. Farther to the south, in Ventura County, a fire broke out in Hill Canyon later Thursday. The Hill Fire burned 10,000 acres through the evening, and more than 1,200 homes were forced to evacuate. The third blaze, known as the Woolsey Fire, burned in Ventura and Los Angeles counties and grew to 7,500 acres overnight, according to ABC, triggering more evacuation orders. The two southern fires are threatening an area still coping with a devastating mass shooting in its community. According to the Los Angeles Times, the Ventura County fire captain said his team responded to both the Wednesday night shooting and the fires, and after coming off their shifts, several firefighters participated in the procession for Ron Helus, the sheriff’s sergeant killed in the shooting. The fires came just a few months after the Mendocino Complex Fire, which razed 400,000 acres, became the largest ever recorded in the state. That fire topped a record set less than a year before by the Thomas Fire in Ventura and Santa Barbara counties. In the fall of 2017, more than 20 wildfires tore through Sonoma and Napa counties, killing 40 people.